Most people prefer to use mixed fractions rather than improper fractions, finding it easier to deal with something like 17 1/3 rather than 52/3. However, multiplying fractions while they're in mixed form can be difficult; as it turns out, it's much easier to simply convert them into improper fractions, multiply (or divide, for that matter), and then change the answer back to mixed form. Let's take a look at how to do that. Before we start, let’s review a few definitions. A mixed fraction is one that has both a whole and a fractional part, such as 3 1/2. An improper fraction is one where the numerator (the top part) is larger than the denominator (the bottom part), such as 7/2. Both of these examples represent the same number (3.5); it’s just written differently. Changing fractions from mixed to improper form is pretty easy; you don’t even need to find a least common denominator, like you would if you were comparing or subtracting fractions. Let’s look at what a whole number represents. Suppose that 3.5 above represents how many pizzas we have left over from a party; we have 3 whole pizzas, plus half of a pizza. We can write that at 3 1/2 (three and one half) or 7/2 (seven halves, which form three wholes plus one more half). Recall that anything divided by itself equals one: 2/2 = 1, 3/3 = 1, etc. To convert from mixed to improper form, start by changing the whole number part into a fraction. Continuing with our example, we multiply 3 by 2 to get 6/2; 6/2 is the same as three. We now have two fractions with like denominators, so we can add: 6/2 + 1/2 = 7/2. 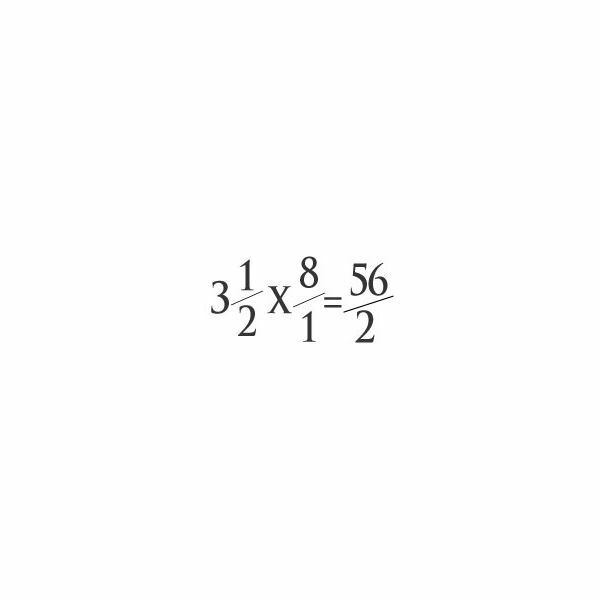 Another way of saying this is to multiply the whole number by the denominator, add the numerator, and place the result over the original denominator. So the first step in multiplying mixed fractions was to change both numbers into improper fractions. Finding the product of two fractions is easy: just multiply the numerators, then multiply the denominators. For example, if I was to multiply 2/3 by 5/7, I would get 2*5 over 3*7, or 10/21. With improper fractions, the same rule applies, so multiplying 3/2 by 7/5 gives 21/10. To change this back into a mixed fraction, I remember that every 10/10 is one whole; I can take 10 out of 21 twice, with one left over, so 21/10 is the same as 2 1/10. Going back to our pizzas, we found that we had 7/2 pizzas. Suppose each pizza has 8 slices, which we can write as 8/1; then there are (7*8)/(2*1) = 56/2 = 28 slices of pizza left!